That’s a good question. What exactly is “normal?” Chasing air? Hunting plastic bags? Hiding? Fetching? In many ways, “normal” is in the eye of the beholder, and the spectrum of cat behaviors is wide. So how do you know what’s normal and when to be concerned? Getting to know your cat and paying attention to his behavior is the best way to tell when something’s not “normal.” For instance, take sleeping. Cats sleep a lot. 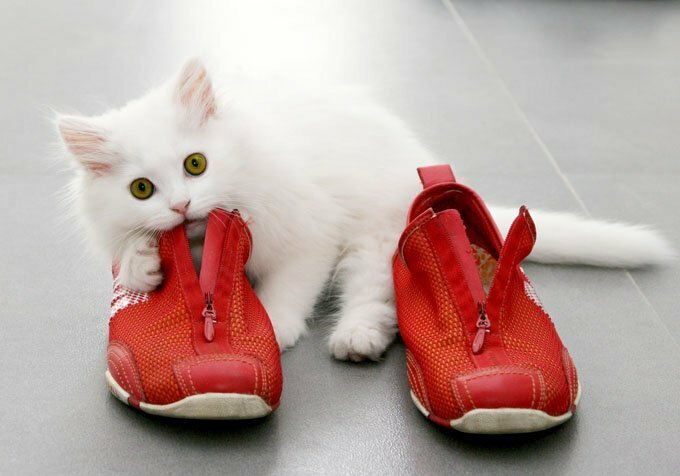 But if your cat is sleeping more than usual for him, hiding in strange places to sleep, looks uncomfortable, or growls when you pick him up, he may not be feeling well. Never assume that your cat is sleeping all day just because he can. Illness or injury can strike suddenly, so be sure to check up on your cat several times a day. What cat owner hasn’t stepped on a wet hairball? Hairballs once in a while are pretty normal for a cat. Some produce more than others, and they can be worse in the spring and fall. Regular brushing can help, or an over the counter hairball remedy (if your cat will eat it!). Pay attention to what’s being thrown up, however. Food, plants, foamy or yellow liquid coming up three or more times in one day — or for longer than two days — indicates a trip to the vet is in order. New environments can be challenging for cats. They may hide for a while until they feel safe and comfortable. Normal behaviors like playing or eating may decrease. But if your cat hides and does not want to interact with you, hisses, or freaks out if you try to pick him up, he may be feeling overwhelmed. Give him some time, or set him up in a small space until he feels safe. Cats bond and interact with humans differently. It’s pretty much up to the cat. If you’ve got a new cat, and you’re not sure where you stand, pay attention to behaviors like rubbing on furniture (redirected affection), being in the same room with you (although not in your lap), eating in your presence, and seeming generally happy and relaxed. Beware of having too many expectations about what the relationship “should” look like. Be patient, relax, and enjoy the bond between you, however it appears. If you do need help, the more information you can give a vet or behaviorist, the better they’ll be able to help. Put yourself into your cat’s “paws” from time to time. Something that seems bizarre at first may make perfect sense when seeing it from their perspective.